Grinding teeth, also known as bruxism, is a persistent habit that tends to occur subconsciously during sleep. It can also happen while awake and sometimes takes the form of jaw clenching instead. While some people can grind their teeth without harming themselves, regular teeth grinding can cause persistent jaw ache and eventually wear down your teeth in the long run. 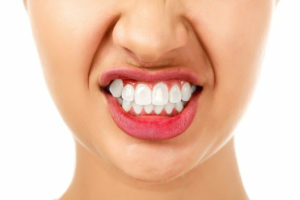 Grinding teeth is often related to stress or anxiety. Most people will find that bruxism will come and go, and will be more prominent during times of high stress or concentration. It can also be exacerbated by certain lifestyle choices, including drinking alcohol, smoking and using recreational drugs. Managing stress levels is extremely important for people trying to prevent themselves from grinding their teeth. Cutting down on alcohol or smoking can also have a positive effect.